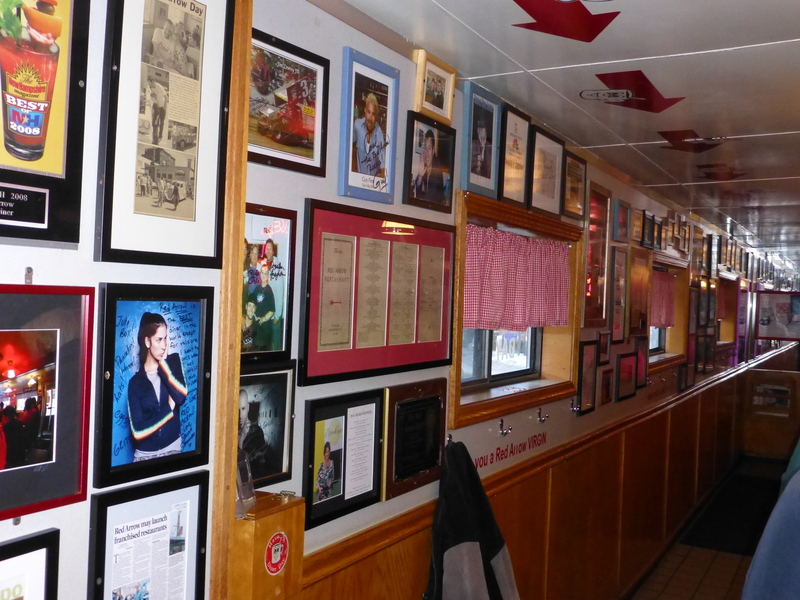 Corned Beef For St. Patrick’s Day At The Ever Outstanding “Red Arrow Diner” In Manchester, N.H.
>> “Red Arrow Diner” — Apr. 8, 2012. 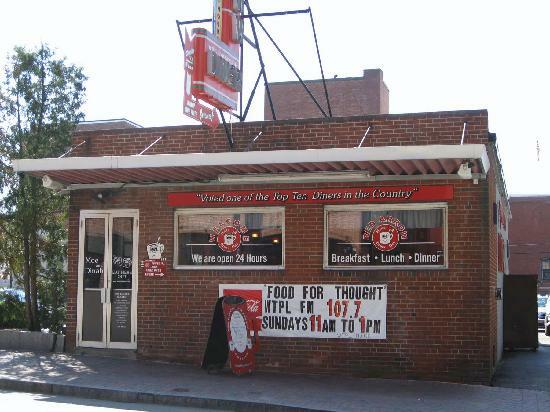 The justly famous (and their new outdoor banner claims “Nationally Famous”) “Red Arrow Diner“, on Lowell Street, in Manchester, N.H., proved yet again yesterday why they set the bar that other local diners, e.g., “Roger’s Red Line Diner” in Portsmouth, strive to match. Deanna at an appointment in Bedford and I had asked for it to be on March 17 knowing that it was St. Patrick’s Day — and as such a good day to eat out in Manchester. After the appointment, around 5:30 pm, I took the ‘back road’ to Manchester while Deanna and the kids argued about the merits of eating out and if we were eating out where we should go. Then as I got towards Elm Street they all perked up. Deanna said are we going to the “Red Arrow?“. Teischan was beside herself. 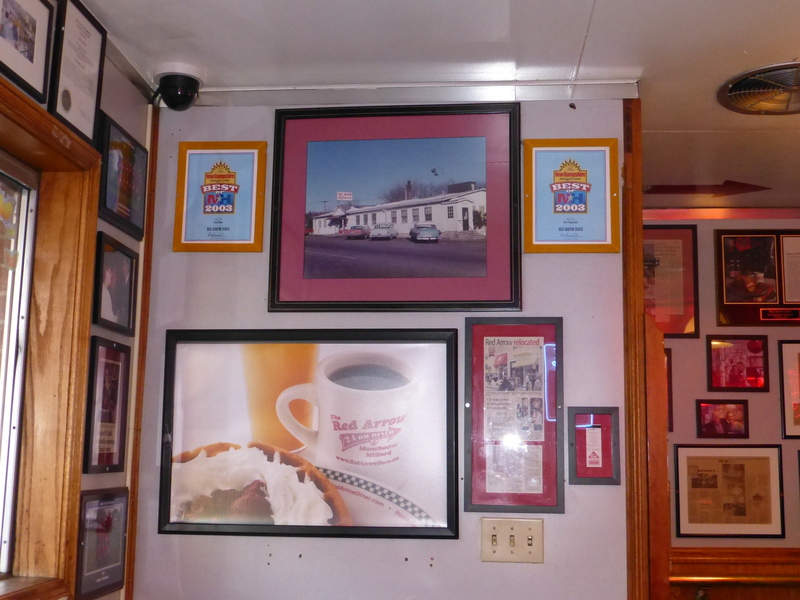 I had thought that we might go to an Irish pub but there were 3 firm votes that we should go to ‘the Diner’. 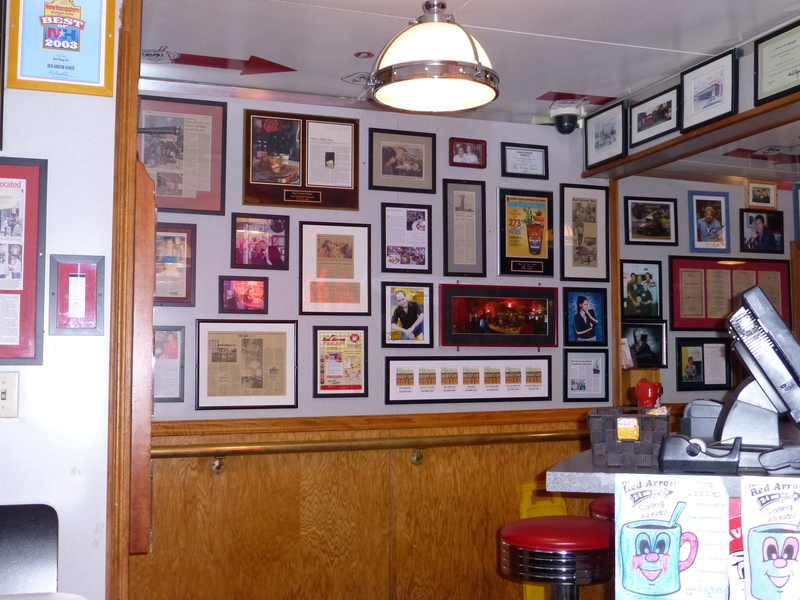 That alone is one heck of a testament to this diner — though I always like to point out that they certainly don’t need any endorsement from us, given how well known they are. 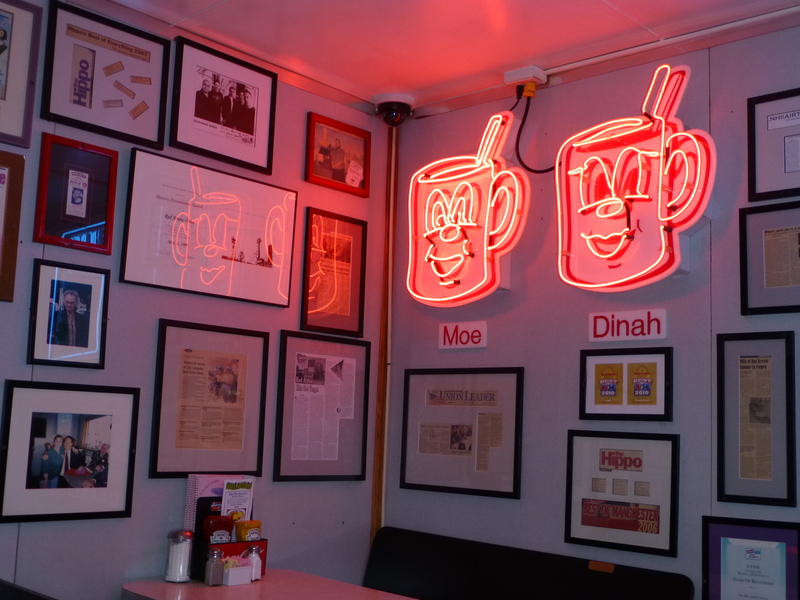 What was striking was that just 24 hours earlier I had run into solid opposition about going back to “Roger’s Red Line Diner” — though we were right there after going to see “Mr. Peabody & Sherman“. But now all three were of one mind that they wanted to go the “Red Arrow“. We have been going there on a fairly regular basis for the last 2 years. It is our default dining choice if we are within 10 miles of Lowell St. Yes, I have a VIP Diner card — that according to Deanna now has a $5 credit on it. Wasn’t sure how crowded it would be. It was relatively busy but not packed. Deanna got us our usual table/booth — or at least the one that we have sat at most often. It is the one where Al Gore sat. See above. 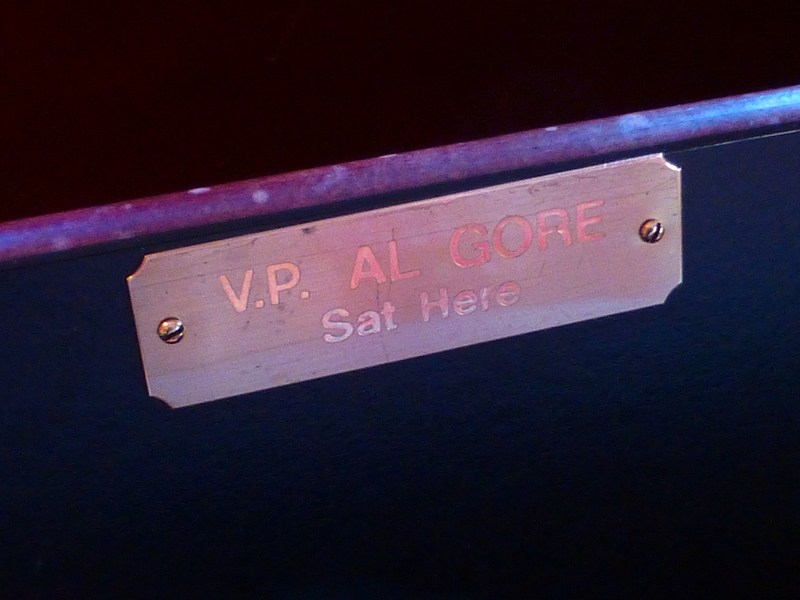 It is funny the kids always make a point of leaving the Al Gore seat for me! And I am not that bigger a fan of his — at least not anymore. It was a good dining experience — as it invariably is. They, of course, have pancakes around the clock — unlike “Roger’s“, which was ‘strike one’ for them as far as Teischan was concerned. They even make kids Mickey Mouse chocolate -chip pancakes with the two big ears. That is Teischan’s staple. 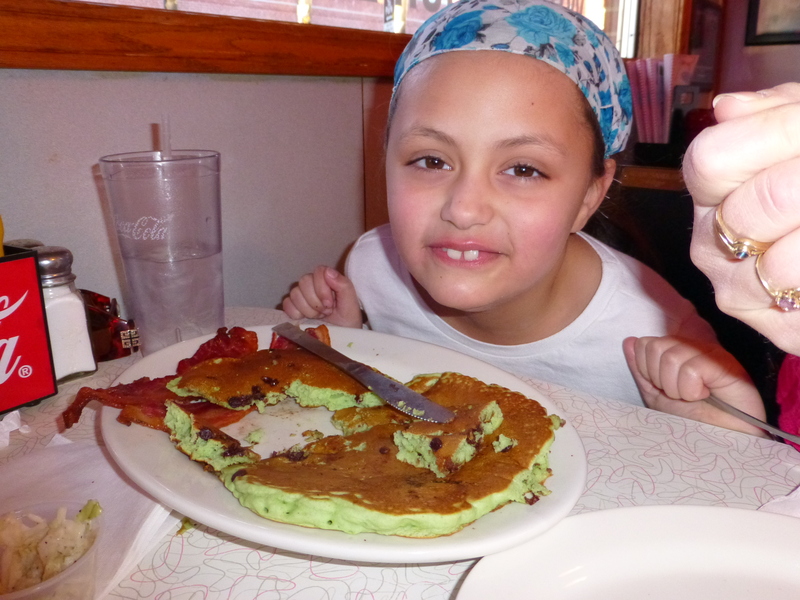 Yesterday, for St. Pat’s they made the pancakes green. See above. Very cute. They did have a special St. Patrick’s Day menu featuring many corned beef items. Given my low-carb diet (which is why I now prefer diners) I opted for a cholesterol heavy (but I take a handful of Liptor every day), very sinful corned beef omelette with Swiss cheese. I like Swiss cheese. The holes cut down the calories. Honest. The omelette came with ‘one of the usual starches‘ plus toast. I asked if I could have a small salad instead of the starch and toast. The waitress, who was very nice, was surprised that I didn’t want toast but said it would NOT be a problem. That is why I like the “Red Arrow“. Nothing is a problem. They always take care of you. Deanna and Devanee had their inevitable cod and chips. It had to have been good since it was gone in no time. My omelette was divine though I felt 2 pounds of weight going on to my waist. Funny how the “Red Arrow” just makes you feel good. 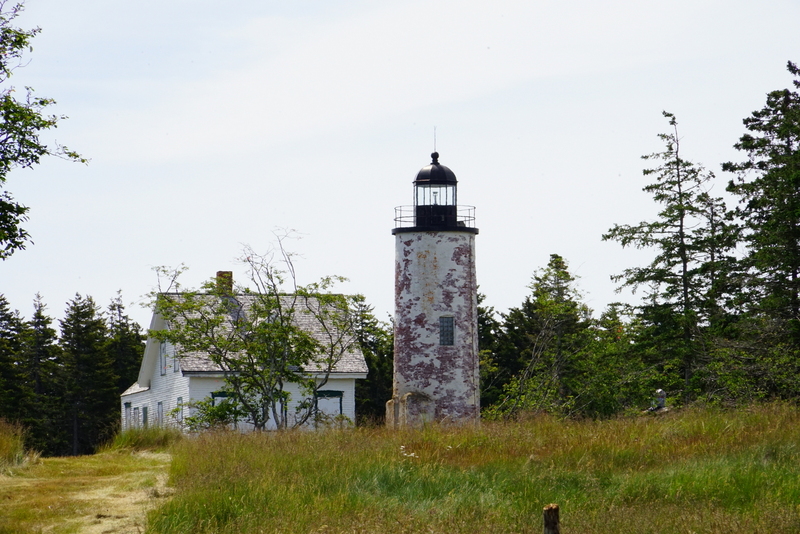 It is very small and kind of ‘dark’ — especially say compared to the “Roger’s Red Line” with its acres of glass. They also never have too many servers. Yesterday it was but two. But they always do good. Interesting. Well everybody was happy. It wasn’t too expensive. So that was good. Good deal. Made my St. Patrick’s Day. Malaysian Airlines MH370: The ‘ACARS’ Flip-Flop Shows How Clueless The Experts Have Been. >> — Mar. 13, 2014. >> — Mar. 10, 2014. >> — Mar. 11, 2014. Click to access original from ‘The Malaysian’. You don’t have to look far. Wikipedia seems to have a fairly decent writeup. Click to access. This flip-flop over the ACARS is beyond the pale? I have to think that there must be at least 10,000 people fairly familiar with the workings of ACARS on a Boeing 777 around the world. NONE of them KNEW that the 777 ACARS, as we had been initially led to believe, does not continually transmit data but only does so on a periodic basis? That is HUGE. So when they, meaning the clueless Malaysian officials, that the ACARS was INTENTIONALLY turned off at 1:07 am (or thereabouts) — that was totally bogus. That was just when ACARS last transmitted. It was NOT supposed to transmit for another 30 minutes . None of the EXPERTS spotted this? Don’t buy that for a second. Yes, the idiots that claim to be ‘experts’ that appear on CNN etc. wouldn’t know an ACARS if one smacked them on the face. But what about the real experts at Boeing and the company that actually makes the ACARS equipment. They would have known that. Plus, we now hear, though I had to piece it together, that ACARS did report, possibly in the 1:07 transmission, that the flight path change had been programmed in. They missed that for 10 days too. Though everything and anything to do with flying intrigues me, I am not an aircraft or avionics expert. But, after 35 years of troubleshooting very large computer systems I know what to look for and what questions to ask. Yes, there is a lot of gamesmanship involved. Nobody wants to play their hand too quickly. The Malaysian officials come across as beyond pathetic. I feel bad for the Malaysians. They deserve better. Look at the 4 in the picture above. I commented about one of them before — that he looked like he was asleep. He is the CEO of Malaysian Airlines? Come on. Guy looks like he is on life support. The U.S. should really take over this whole search mission IF we are to find this plane. One last thing: doesn’t the U.S. have all sorts of undersea ‘microphones’ to track submarines AND didn’t we start deploying smart buoys in the Indian Ocean to detect tsunamis. Wouldn’t some of these have picked up the vibrations if a huge 777 plunged into the water? >> phones … — Mar. 13, 2014. From the “Irish Independent”. Click to access. 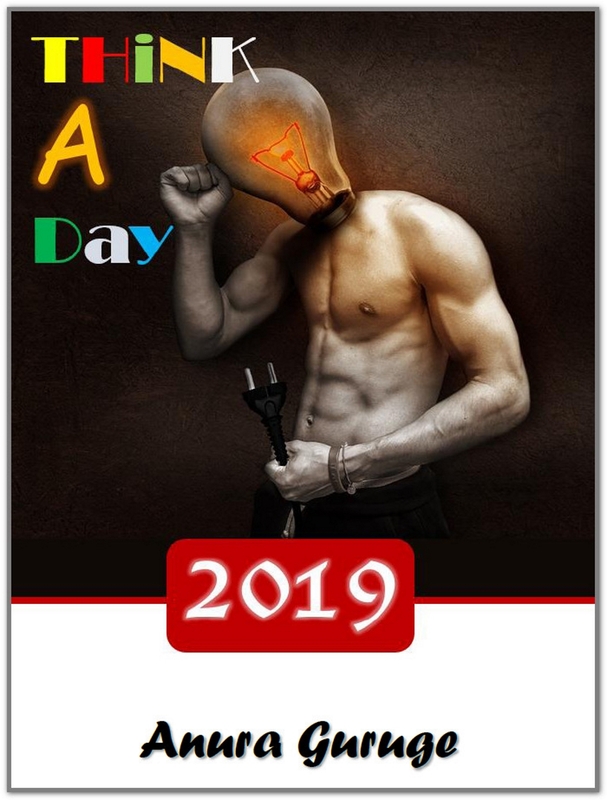 Click for ‘India Today’ coverage. Folks at Reddit are acknowledging that I mentioned possibility 4 days ago. Link to relevant ‘Reddit’ board. There was nothing sinister about me suggesting that the Maldives was a possibility. It just happened to be in the right geography. And lets be honest, how many people in the U.S. have even heard of the ‘Maldives’ when most haven’t heard of Sri Lanka. I am very fond of the ‘Maldives’. Beautiful country. Beautiful people. I only have the most wonderful memories of the times I spent in the Maldives. The Maldive people don’t have to be implicated — just in the same way that we talked about the possibility of MH370 landing in eastern Sri Lanka. had landing maps for Sri Lanka and Maldives. Click to access original coverage from Malaysia.